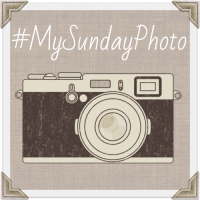 It has been many months since I joined in with the #MySundayPhoto link up and I thought it might be time to get back to it as I always love finding that one photo to share every week. So much so I could take many extra photos just to be sure I had one I would love! We have taken many great photos this past week with so much having happened. I wasn't sure which I had wanted to share until I remembered about D's lovely little photo session on Valentine's Day while we sat in Cafe Nero for a little break during our rather busy day. D had got inspired and he took some beautiful photos. That is why I choose one of his photos of the beautiful little jug of red roses that sat on our table and seemed to inspire D to take his photos with his new little hedgehog friend Hank (a new teddy) which we got him for Valentine's Day. Hi Tammy, whoever knows where the next bout of inspiration will come from? D did a nice job taking the photo of the roses. Very Valentinesesque. Ahh! How lovely! They are gorgeous flowers! So pretty! Yes I do agree, nothing brightens a room like fresh flowers. I must agree with you. Roses are beautiful. 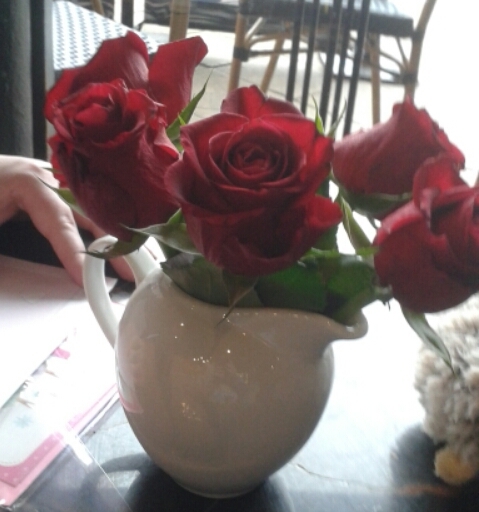 I love the little jug almost as much as the roses themselves. It was a lovely little thing to brighten up our day. I do agree. Inspiration can hit anytime! I'm very proud of how he did in his photography skills. Thank you for coming over !